It used to be that getting inspired to superheroics was as easy as naming an Indian - you just went for the first thing you saw: a bat flew through Bruce Wayne's window; creator Gardner Fox watched a hawk flying through the sky. Basically, leaving your window open in the DC Universe is a surer path to herodom than being around radiation in the Marvel Universe. While removing a bullet from a witness to a crime, Dr. Charles McNider was blinded by a grenade meant to silence his patient. During recovery from his injuries, McNider was startled when an owl crashed through his window. Removing his bandages to investigate, he found he could see in perfect darkness. He later found that he could not see in daylight and developed special goggles and "black-out bombs" to help him see in light and fight crime. He adopted the owl, "Hooty," and joined the Justice Society of America to continue his fight against evil. Dr. Mid-Nite was the first blind superhero, and is fairly unique in that he's a real doctor. It's basically just him and Doctor Strange; heck, compare him to "Doctor" Doom, who's actually a college dropout. Chuck, on the other hand, had his doctorate, and was a skilled practitioner before losing his sight. Though no word on whether he'd ever practiced falconry before picking up a bird sidekick. Unlike some Golden Age characters (Atom, Green Lantern, we're looking at you), Dr. Mid-Nite's costume isn't a hideous eyesore. 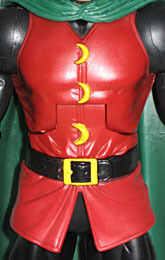 There's a reason that when a new Dr. Mid-Nite was introduced in 1999, the costume underwent only minor cosmetic changes. It's basically a black bodysuit beneath a red tunic, with light brown gloves and boots, and a long green cape. Classy! You know, considering how Daredevil first dressed, this outfit proves that being blind doesn't mean you've got no fashion sense. He's even accented his look with cresent-moon buttons running down his chest. The sculpt is good, with distinct piping around the edges of his shirt, and the "cloth" bunches realistically around his thick leather belt. The paint on the figure is okay, but there are several areas you need to watch out for. It's not so much that there are a lot of small details, but that what details there are are almost universally sculpted elements. Remember when the apps on Commander Steel were severely misaligned? It's nothing like that, just some colors that don't hew as closely to their lines as they could. It's the obvious stuff: the goggles, the moons, the buckle, the edges of his boots... all the places you'd expect. Give him a once-ever before you head to the registers. Dr. Mid-Nite has all the same joints as every other figure in the DCU Classics line: balljointed neck, swivel/hinge shoulders, swivel biceps, hinged elbows, swivel wrists, hinged torso, swivel waist, swivel/hinge hips, mid-thigh swivels, hinged knees and hinged ankles. However, that's not where the count stops! Unexpectedly, he also has swivels beneath the boot cuffs. Not even Red Tornado got that benefit. It's a minor addition, but when they're 12 series in and still haven't got the elbows and knees right, every little bit helps. The set includes Mid-Nite's owl, Hooty. Yes, "Hooty." What can we say? The guy was a doctor, not a writer. 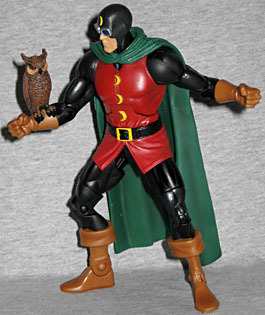 DC Direct's done two Dr. Mid-Nite figures before, and each had a different way of dealing with the owl: one had a replacement glove with the owl molded onto it, while the other used magnets. Mattel's choice was to mold the owl to slip onto the figure's forearm and use friction to hold it there: the tail hangs down low enough to provide a counterbalance, and there's a small, unobtrusive lip on the tail that fits over the end of the glove to keep Hooty from sliding down. The sculpt has lovely details, and the paint is several nice shades of brown. The owl is about 1¾" tall, and has a swivel neck - meaning yes, you can turn his head all the way around. Fun! 2010 is DC's 75th anniversary, and Mattel is helping them celebrate by including collector buttons in each package. Dr. Mid-Nite's pin comes from All-Star Comics #8, the issue in which he joined the Justice Society. The pins are molded from translucent blue plastic - the front is printed (?) with the image of choice, and the back has the DC 75th Anniversary logo on a field of stars. Of course, the figure also includes a piece of the DCUC Series 12 Build-A-Figure, Darkseid. Yes, yes, I know Mattel calls their BAFs "Collect & Connect" figures, but that's a silly name, so we ignore it in favor of helping to genericize ToyBiz's superior term. Anyway, Doc's got Darkseid's left arm, which has a blue glove and rocky grey skin, just as it should. Dr. Mid-Nite isn't one of the more recognizable names in the DC Universe - neither the original guy, nor either of his successors. But he's got a swank design, and the figure shows it off well. However, unless you're trying to build the big new Darkseid, there's nothing in particular to recommend the DCU Classics Mid-Nite over either of the DC Direct Mid-Nites. Well, the articulation, I suppose, but all three figures have their strong points. If you want Darkseid, get this one: if you want Dr. Mid-Nite, take your pick.